Use littleleaf boxwood as a sheared border for a walkway, to delineate a boundary, accent or surround a space; sort of a miniature hedge. 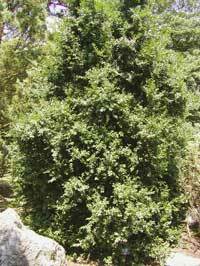 Use it in a container, as a background for other low-growing plants, or, trained and trimmed, for topiary. The best container size for boxwoods is 1 to 2 feet in diameter. These shrubs need a well-drained, loose and crumbly soil mix. Containerized boxwood makes excellent topiary specimens.